Start off making two “African Flower hexagons” . There are already several tutorials (and even youtube-videos) explaining this, I would recommend HeidiBears tutorial if you haven’t tried making one before as it is very throughout. Make one hexagon using several colors (of your choice) and one unicolor (this is going to be the bottom of the turtle), so I picked a rather light color -pink. And – make two rows of dc. 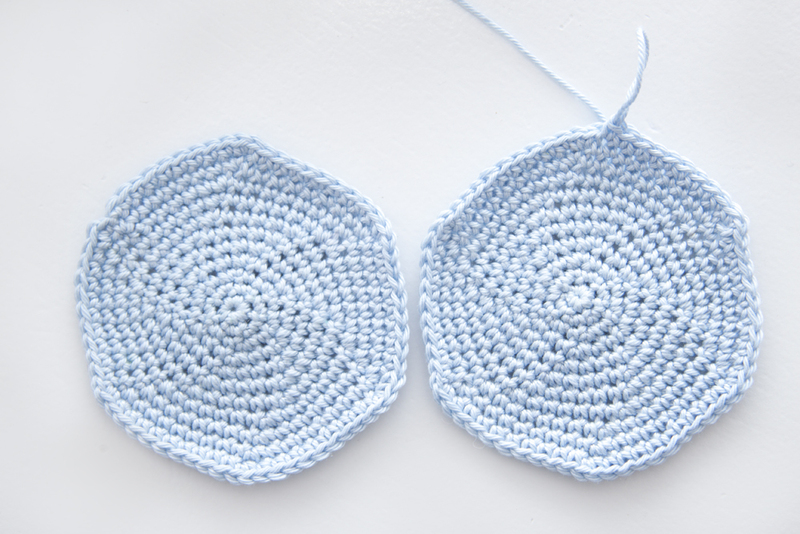 You should be familiar with most basic crochet techniques. And also the “magic ring”. 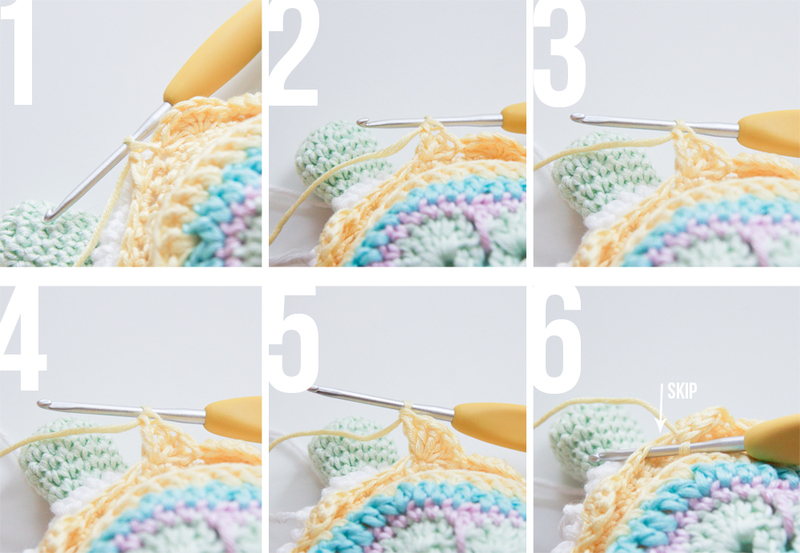 For explanation on how to do the invisible decrease/increase (and other useful tips) please check out this page on Amigurumi basics. Add more stuffing if necessary, but not too much. Flatten ends and crochet/stitch together. Weave in ends. 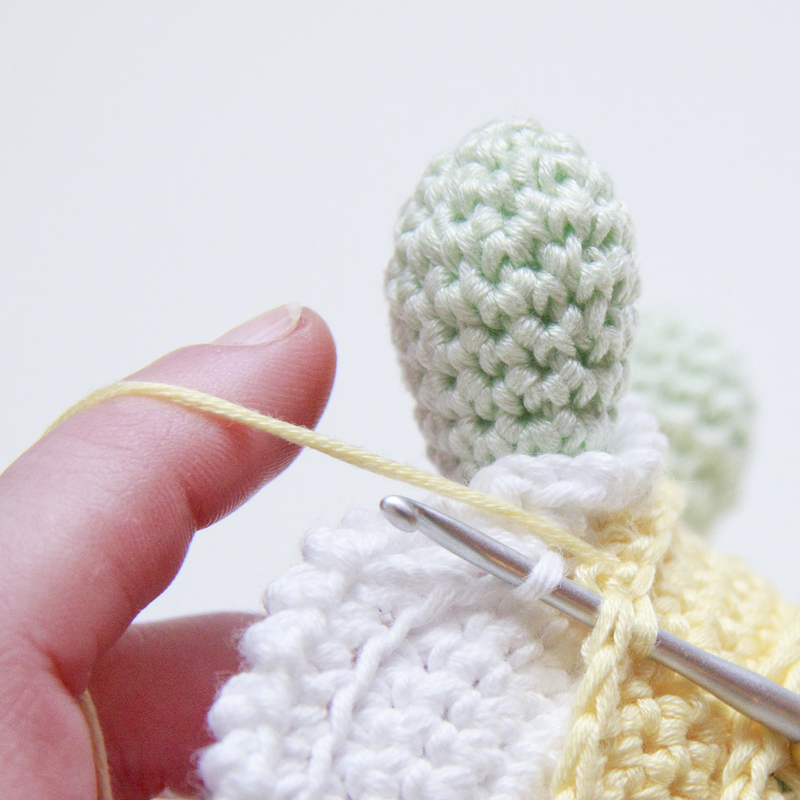 Add a little bit of stuffing, flatten ends and crochet/stitch together. Weave in ends. 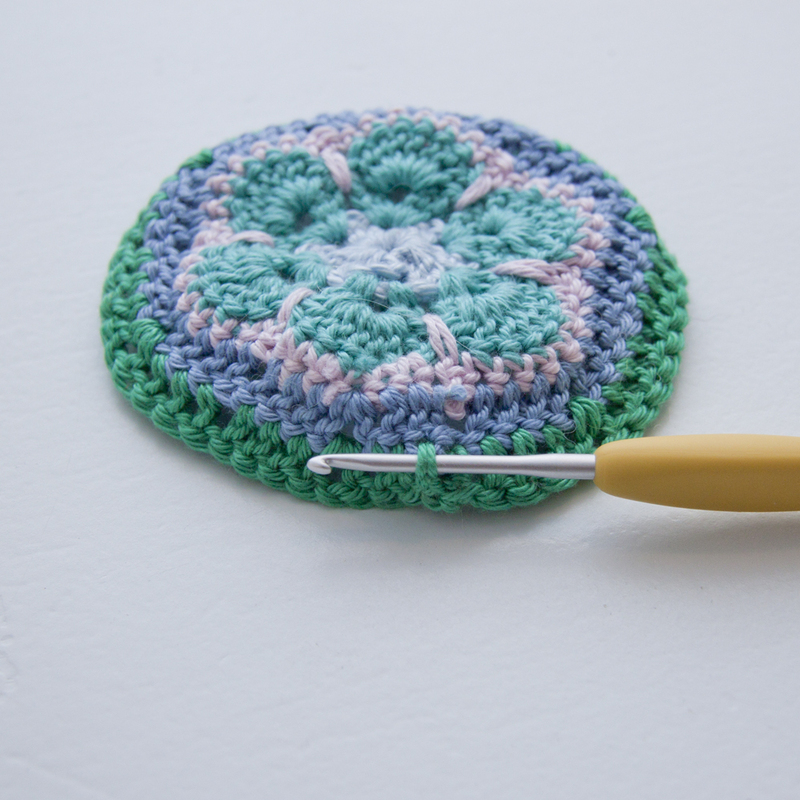 Flatten ends and crochet/stitch together. Weave in ends. Using needle and pink yarn attachhead and legs together to the pink african flower. This is how I placed my head/legs. 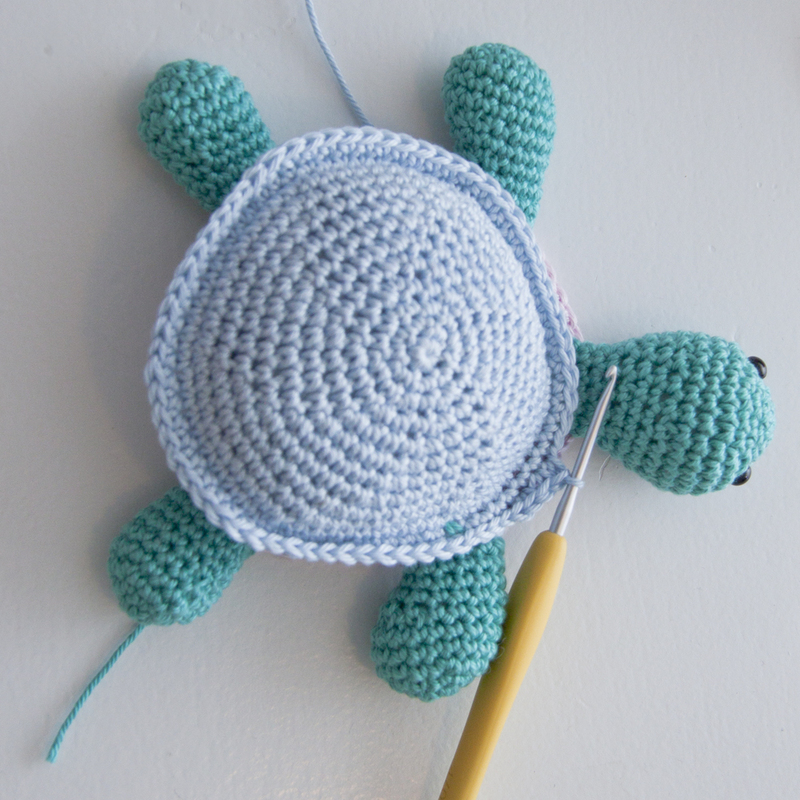 This is going to be “the stuffing” of the turtle, and only the edge will be visible when you’re done with your turtle. Normally I like to spread increases when making a circle, but for this it’s ok – even preferable to increase in the beginning of each round as it will resemble more of a hexagon shape. Remember to fill before you complete the round. 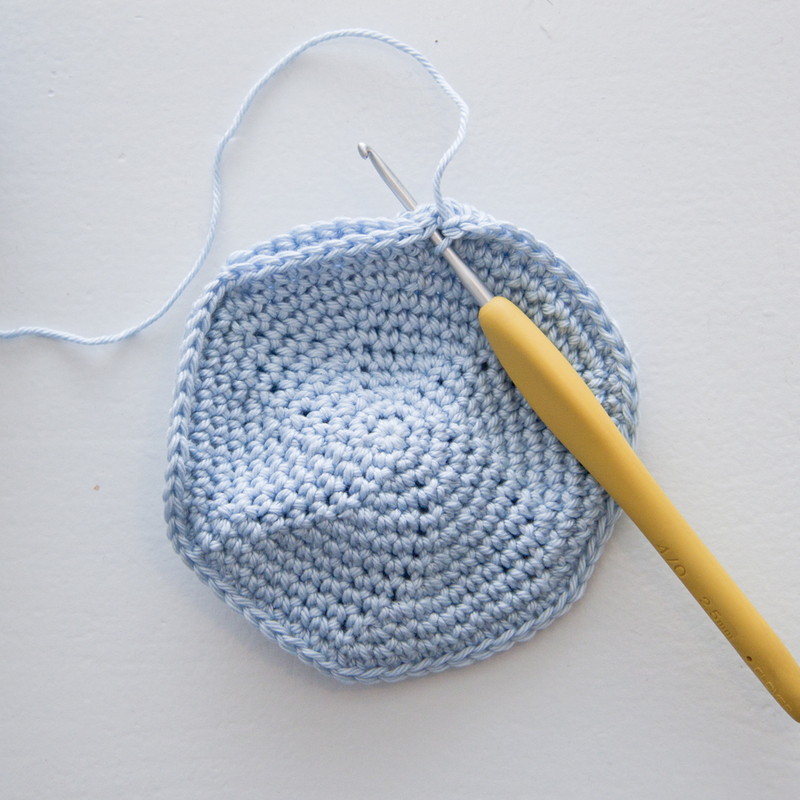 When you have completed the round (and remembered to fill before you closed) crochet another round sc in every st.
Hook through both blue and pink st as seen below. Yo, pull through. Sc through only blue loops above head/legs. Body is now attachet to the bottom. Do not cut thread yet. Through back loops only (blue st) crochet “2ch, sc” in every st. Now fasten off, and weave in. Now we’re going to make the shell. Pick up the multicolored flower you made earlier. Turn the flower. Hook through bottom of the last round of dc. 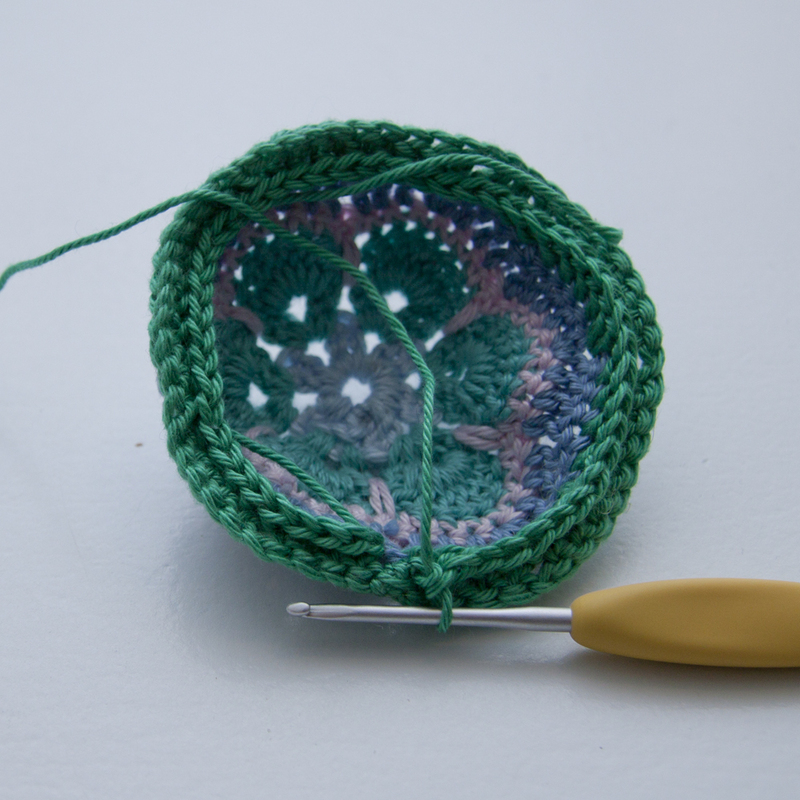 Using same color (in my case – green) attach thread with a sl st, then sc all the way around. Do this until you’ve made 4 rounds of sc. The next (5th) round increase corresponding to every hexagon angel (a total of 6). Now we’re going to attach the shell to the rest of the turtle. Put the shell on top of the turtle bottom/body. Hook through both loops last round of shell and through front loops of body (blue) and sc all the way around. Finally add the shell edge; 5dc in 2nd ch from hook, skip 1 st, sl st in next, skip 1 st, 5dc in next, skip 1 st, sl st … and continue in the same pattern all the way. You may have to do some minor adjustments (skip 2 st at some point) because the numbers probably don’t add up 100%, but there shouldn’t be any major trouble. Weave in all loose ends and you’re done! 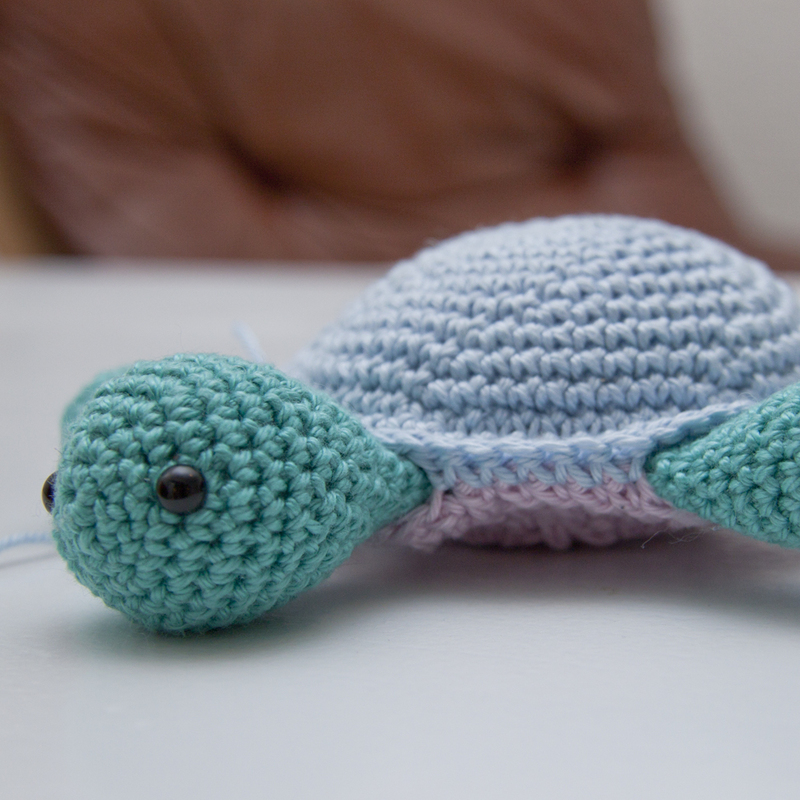 – I’d love to see the result if you made your own Tina Turtle. On instagram please hashtag #tinaturtle or tag @inarho. 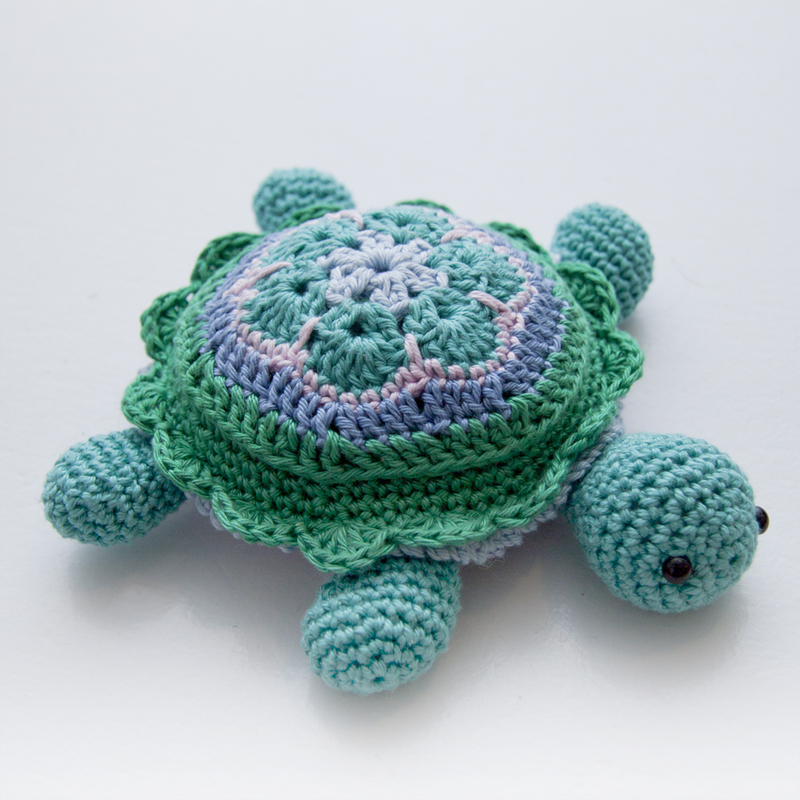 – You’re not allowed to distribute/sell this pattern, if you want to share please provide a link back here (inart.no/turtle-pattern). 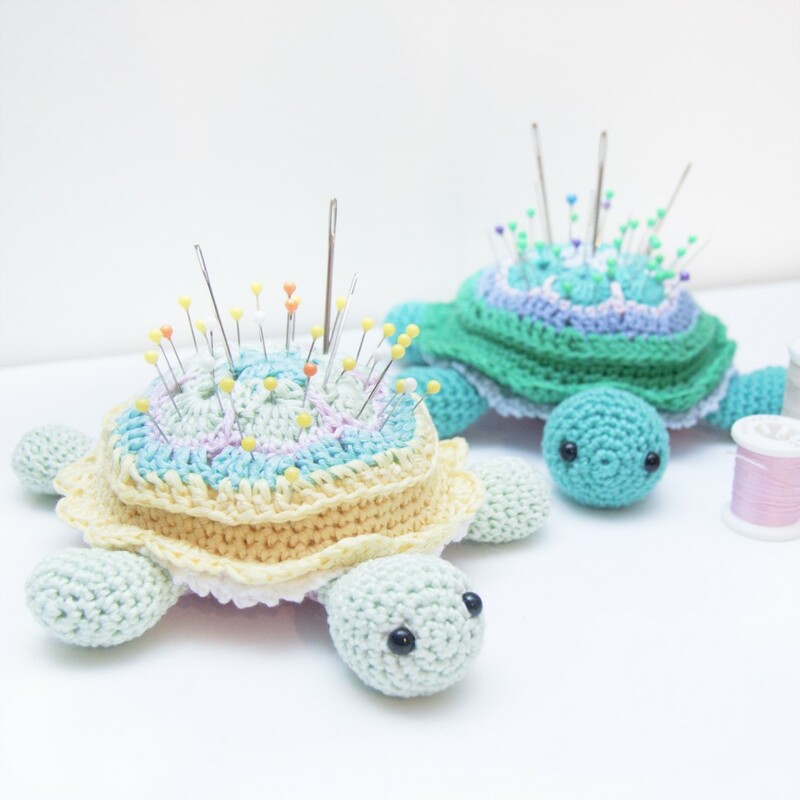 – You’re allowed to sell pincushions/plushies made off this pattern, but please provide a credit note and preferable a link back to inart.no (or @inarho on instagram) letting people know where the original design came from. My mom actually made something similar to this as a rattle for my youngest daughter when she was born. This was almost 40 years ago. This is the cutest turtle I’ve ever seen . Love it and working on one now. Will definitely give you the well deserved credit for designing this. Thank you. 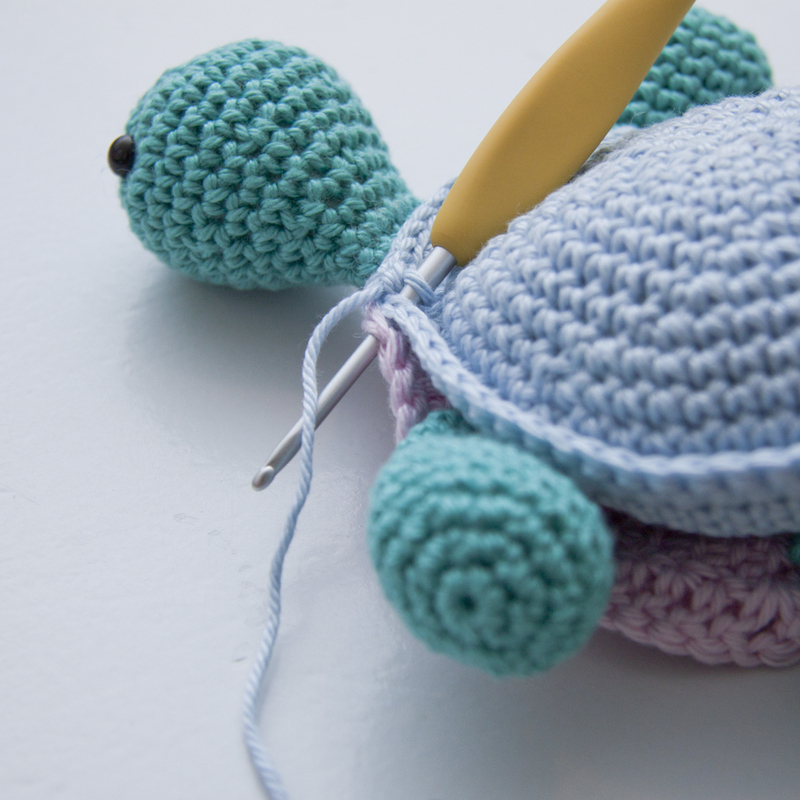 I adore this little turtle and would love to make some. Do you have a pattern for this in a pdf format so I can save it on my computer? I do not yet have a printer and inks. If not, would you consider sending the pattern by email for me to keep, please? Hello, Atm unfortunately I don’t. But you can copy the pattern into word or another text editing program and save it to your computer? Thank you so much for sharing this beautiful pattern. It is so nicely designed with details that give a high quality product. Love the layers, the internal pouch, and the edging of the shell and the body. I modified 2 things, in photo it looked like legs and head attached to right side of belly, but I attached to wrong side. Also I didn’t do 5 rounds of picked up sc on shell, just did 2 so that it didn’t get so much larger than body. It turned out like your photo, so I may have picked stitches up incorrectly. Thanks again! 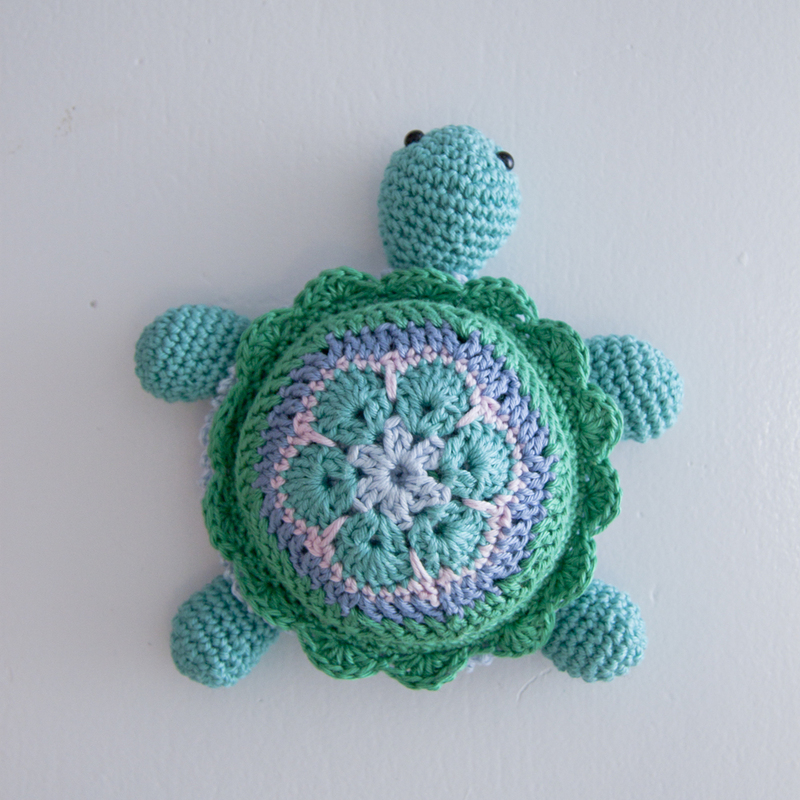 My turtle today and I love her.I Made ist for my Mother in law but I will do a second one Quick for my little doughter (4 months) so she ca Player with it. Greetings from Germane and I will do you air Ballon too . 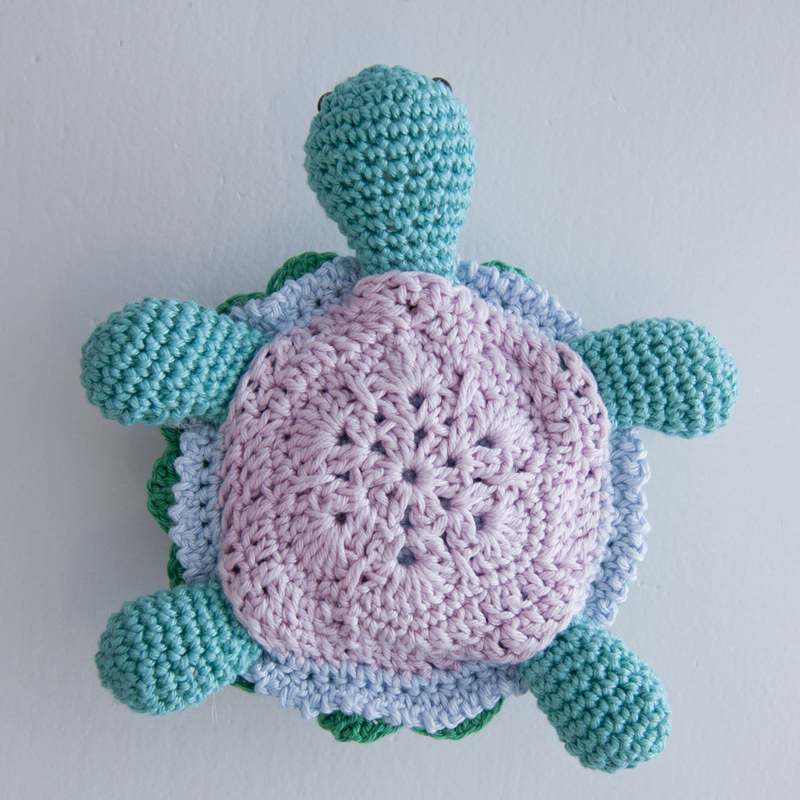 I finished my turtle today..
She turned out to be adorable, she is going to a little girl as a stuffie. 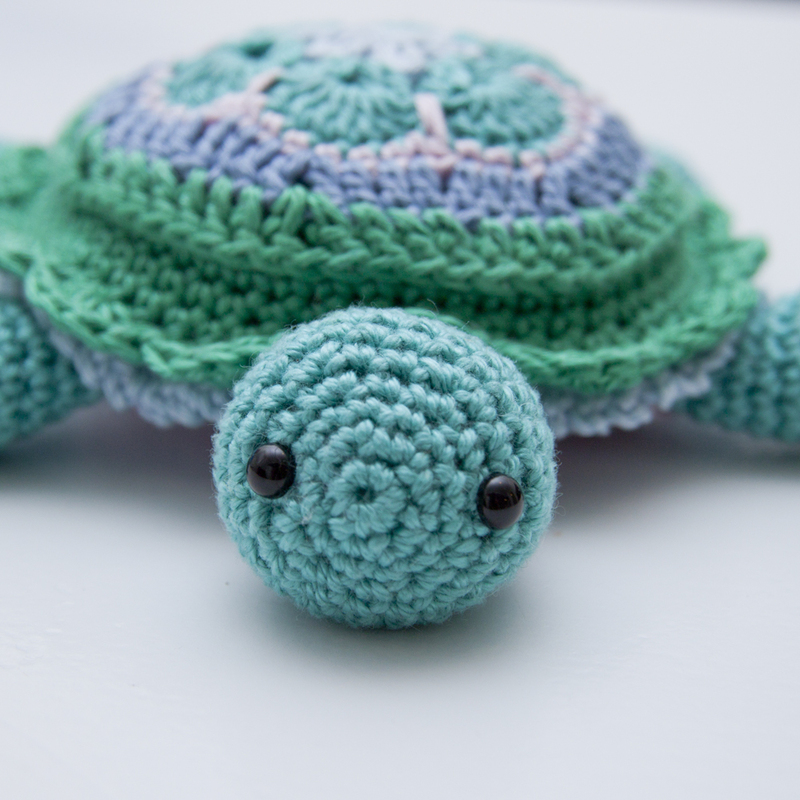 Is it possible to provide the exact colour numbers for the yarn used in the darker turtle? 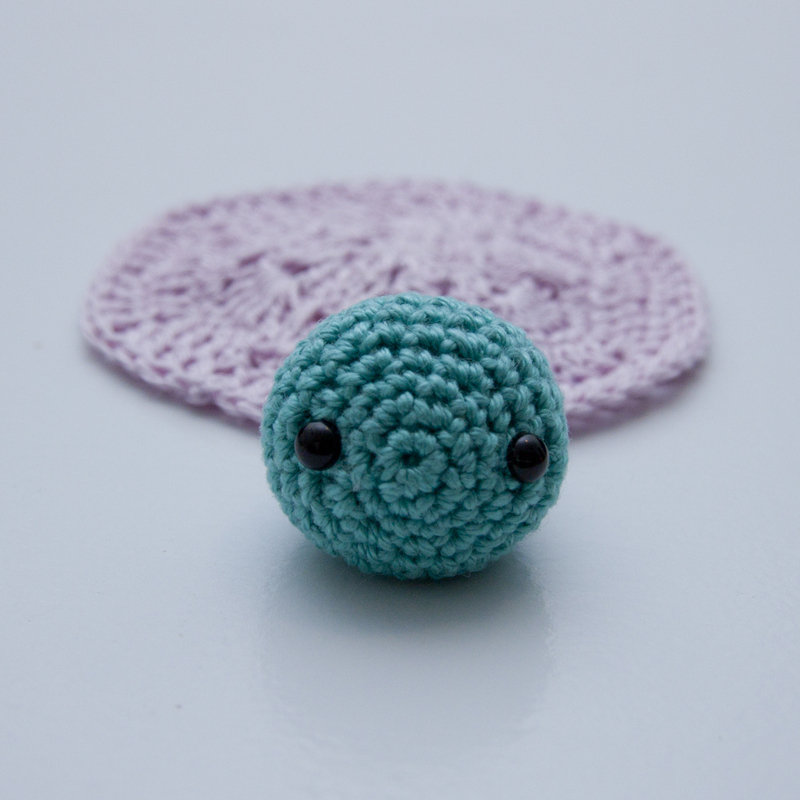 My grandson wants me to make one and I would like to use the same colours as shown. 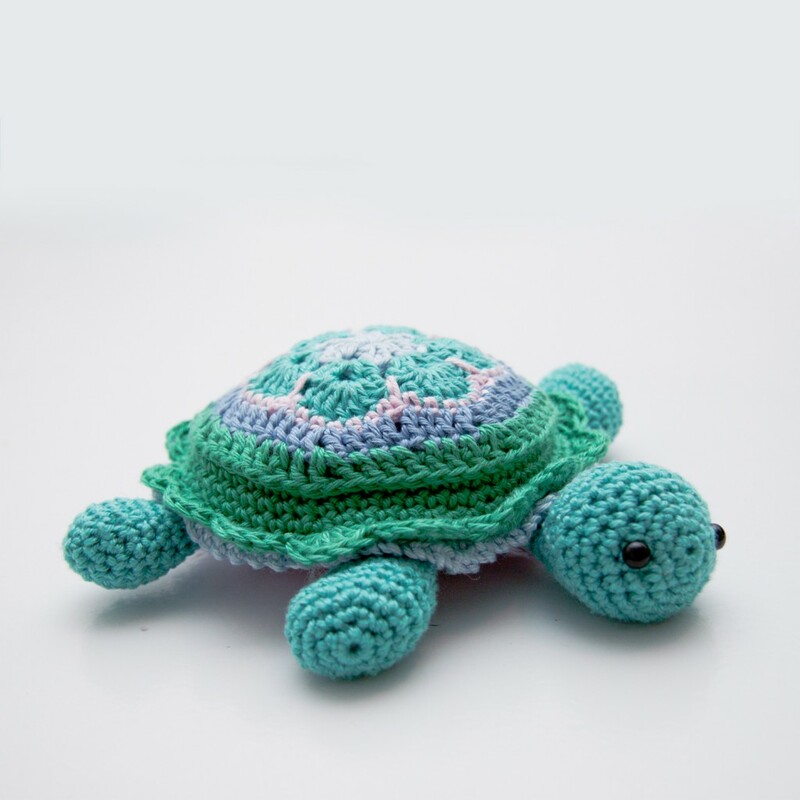 Could you supply the actual colours and ID numbers of the yarn used for the darker turtle? My 4 y.o. grandson wants one and I would like to do it in the exact colours if possible. I will send you a picture after I finish it. 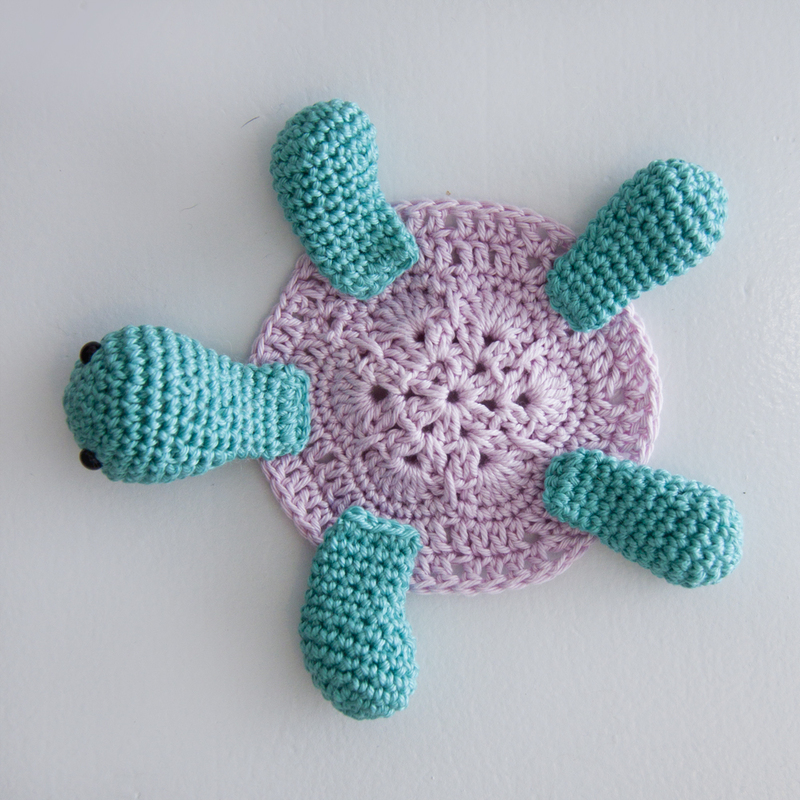 Right now I am going to make it for my niece who loves turtles, and is having her first child so I am making it for my Great Niece. The pattern as well as the pics seem very detailed. But for some reason I can’t find the materials list with yarn information such as yarn type (worsted #4) or colors. 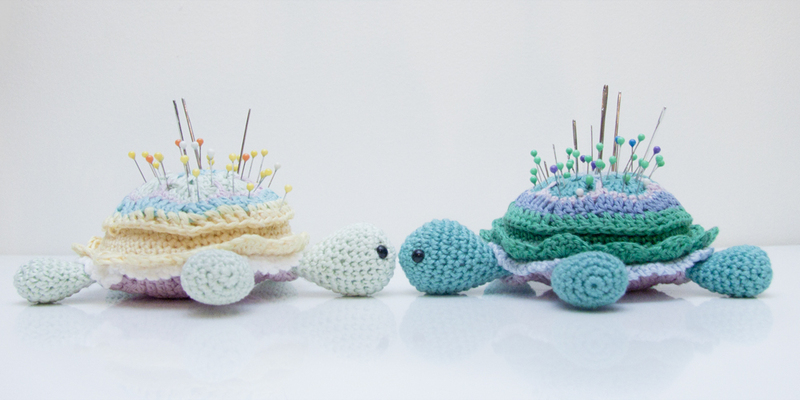 I’ve decided to make one of each color combo of your 2 turtles. Thanks.